Does your toddler need orthotic insoles? Although toddlers often seem to have flat feet, and it is regarded as a natural stage of foot development, flat feet in toddlers can sometimes cause a number of issues. - Foot pain, ankle pain, pain in foot arches. - Recurrent foot fatigue and achy feet. - Knee, hip and lower back pain. - Limping or frequent tripping, clumsy, odd walk. - Walking on the inside of their feet. How can custom-made orthotic insoles help your toddler? - Correct biomechanical problems with your toddler’s feet. - Help maintain your child’s feet in a natural position. - Prevent your toddler’s feet from rolling excessively to the inside (overpronation). - Provide relief from pain and fatigue. - Help prevent further damage from developing later in life. Dr Insole’s orthotics for toddlers are specially designed to correct any particular biomechanical issues that affect your toddler’s feet. Our orthotic insoles for toddlers are made from EVA – cushioning, durable and shock absorbing material, with built-in arch support for improved foot and leg alignment and correct posture. Dr Insole’s orthotics are flexible and light, so they will not interfere with your toddler’s daily activities. Toddlers may need to have a new pair of orthotic insoles prepared every time their feet grow a size. 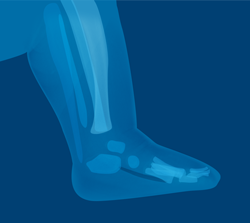 To help you spread the cost of new orthotics, we offer an exclusive monthly payment plan. For just £12 a month, it entitles your child to a new pair of insoles whenever their feet grow a size. Please click here for more details on our payment plan. Dr Insole’s orthotics for toddlers are designed to enhance foot alignment and to improve balance and posture of your toddler. Our orthotic insoles correct biomechanical foot-related problems to relieve foot and leg pain and to prevent further deformities from developing. Flexible, breathable and lightweight, Dr Insole’s custom orthotic insoles are ideal for busy little feet.